Is there an unseen force or a law of nature that God has designed into the world, which silently governs the rise and fall of economies and nations? Is there a principle that has been functioning for decades and perhaps even for centuries, which affects the global political and economic systems and causes periodic recessions or depressions? According to recent publications, some authors have claimed that there really is such a force at work in our world. Many economists and others who study the global financial systems have wondered why major downturns in the economy seem to happen in early fall, especially in the months of September and October. Is it possible that the Bible provides the reason for this phenomenon as well as details on its origin and properties? If this force really exists, it might actually impact the valuation of stock markets, investments, and currencies on a recurring basis. This type of downward pressure on the global financial system may also cause the rise and fall of empires and countries, as economic upheavals often cause major political power shifts. I call this proposition the Shemitah Effect, after a Biblical law and the Jewish name that is used to describe it. In 2012, the Christian Rabbi Jonathan Cahn published a book entitled The Harbinger: The Ancient Mystery That Holds the Secret of America’s Future (Frontline Pub Inc). He described within it, as part of a series of harbingers to judgment affecting the United States and the world, a concept related to an old Jewish law often called the Shemitah (The Harbinger, p. 153). Cahn subsequently went on to publish a second book in 2014 that was exclusively related to the Shemitah Effect, entitled The Mystery of the Shemitah. His writings and talks about the Shemitah are very interesting, and at least they should be read and understood by every Christian. Cahn has postulated that this principle is actually affecting the course of world events and especially the future of the United States and Israel as we move forward in the End Times. With that assertion, it is imperative to learn about the Shemitah Effect as we study End Times prophecy. In particular, we should seriously consider whether such a force really exists and if it is affecting the unfolding of world events in the last days. The first thing to ask is, “What is the Shemitah Effect?” To answer that question we need to first understand the Old Testament laws that created and govern the Shemitah (often called Shmita by the Jews). The word Shemitah is pronounced “shem ē’ tah”, which literally means remission or to release or to let go. Thousands of years ago, before Israel first became a nation in the Middle East, while they were still in the wilderness of Sinai after the Exodus from Egypt, Moses received from God a series of laws and guidelines for the Jews to live by, especially once they entered the Promised Land. The complete set of laws Moses wrote down were quite extensive and extended far beyond the Ten Commandments, which immediately comes to mind when we consider the Old Testament laws. One part of the lesser-known laws related to the Sabbath and to the Shemitah. “but during the seventh year the land shall have a sabbath rest, a sabbath to the Lord; you shall not sow your field nor prune your vineyard. “Your harvest’s aftergrowth you shall not reap, and your grapes of untrimmed vines you shall not gather; the land shall have a sabbatical year. “All of you shall have the sabbath products of the land for food; yourself, and your male and female slaves, and your hired man and your foreign resident, those who live as aliens with you. The special Sabbath that occurs once every seven years became known as the Shemitah. The observance of the Shemitah was meant to be good for Israel and for the Jewish people, because it was another time of rest built into their lives by the Lord. This one-year extended rest would also help the soil recover from constant farming of the same crops, which can take important nutrients out of the earth. Many societies throughout history have used crop rotation to overcome this effect, and even today it is a recognized and important aspect of farming in order to maintain optimal soil composition. Thus, according to the Law of Moses, there was a Sabbath every seven days for man to rest and a Sabbath every seven years (Shemitah) for the land to rest. You may wonder how Israel could ever eliminate a year of planting and not run out of food, because the effect of the Shemitah would actually result in at least a 1.5-year interim between harvests. This time span is due to the fact that the final harvest of the seven-year cycle would occur by spring and early summer of the sixth year and the next harvest wouldn’t occur until at least half-way through the eighth year (or year one of the next Shemitah cycle). This 1.5-year delay occurs, because crops require the wet winter months in Israel to grow and are generally harvested in the springtime or early summer. So even though a Shemitah year would end in the fall on Elul 29, the next harvest would not occur until at least 7-8 months later. Note: The people of Israel actually follow two yearly calendars. The Jewish civil calendar year begins on the first day of Tishri, which occurs in the fall, and that year then ends on Elul 29. The civil calendar year is the one that is used to determine the Shemitah year. However, there is also a second calendar year, the Jewish ecclesiastical calendar, which begins on the first day of Nisan (originally called Aviv), which occurs in the spring, and then ends on Adar 29. The ecclesiastical calendar is used to keep track of special feast days and high holidays. “then I will so order My blessing for you in the sixth year that it will bring forth the crop for three years. In addition, the law of the Shemitah allowed for all people and animals to eat freely of the opportunistic crops which grew during the Sabbath year. The law only required that no one actually plant, harvest, and sell the crops for that year, but that the fruit of the aftergrowth would be available for all to access and consume without charge. 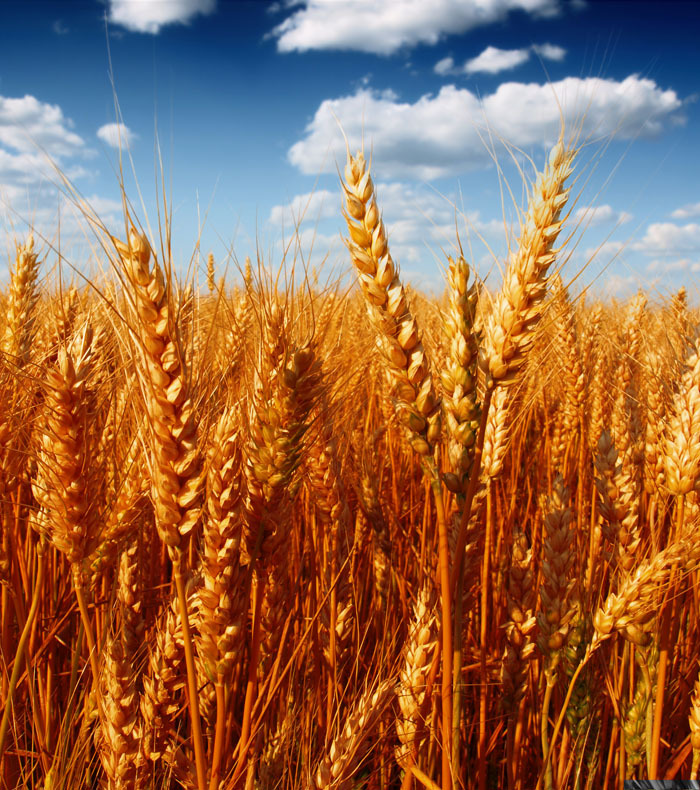 Wheat that grew on its own would be free for all to eat. Fruit that grew on trees could be picked by anyone and eaten. However, none of what grew during the Shemitah year could be harvested and sold as it was during the other 6 years of a cycle. Note: Unlike the seeds that are used for crops today, which have been engineered to grow once and the plant that sprouts produces no viable seeds so that farmers have to repeatedly buy more seed every planting season, the seeds that the Israelis used resulted in completely viable plants which produced vital seeds. Thus, every year some seeds would drop to the ground during harvest and result in new plants growing the next year. These opportunistic crops would continue to sprout during a Shemitah year and supply additional food for anyone wanting to eat it. Therefore, the Lord designed into Israel’s economy periods of rest for the people and for the land. If Israel followed God in these things, then the Shemitah would bring a great benefit and blessing; essentially providing for each farming family a full year off every seven years from cultivating, planting, and harvesting. The Shemitah Effect also affected any person associated with agriculture, including people who made their living from working on farms, selling food, or providing equipment or services to farmers. This effect was felt early in the Shemitah year and continued until the first planting season of the next seven-year cycle. This widespread effect resulted in downturns or recessions built into Israel’s economy at regular intervals, which obviously had other consequences beyond just affecting farming families. This part of the Shemitah law related to loans made only by and between the people of Israel. Through this and other laws, the Lord thus encouraged the people not to go into debt at all; however, if they did take a loan from another one of their Jewish brothers out of necessity, then the remaining unpaid debt would have to be forgiven at the end of the Shemitah year without requiring further payments or obligations. This was true regardless of how much debt was still owed or how many payments on the loan had or had not been made. Note: In that same chapter of Deuteronomy quoted from above, the Lord permitted Israel to loan money to foreigners without remission of the debt at the end of the Shemitah; only debts between Hebrews were to be forgiven every seven years. The Shemitah thus had one aspect related to a Sabbatical rest and another aspect for the remission of all debts within Israel. Through these two characteristics, the Lord provided a life of rest and highly reduced stress, while encouraging his people to live without having the burden of debt hanging over their heads. In Deuteronomy 15:4, the Lord even promised that there would be no poor among them if they followed these basic Shemitah principles. This part of the Shemitah thus provided a cooling off period for Israel’s economy. A mini-recession built into their economic system every seven years which assured that there would be no financial bubbles or the subsequent severe crashes, which often resulted from them. These types of intense boom-and-bust periods characterize the economies of today’s world, and they appear to be unpredictable and unpreventable. During prosperous times economies grow rapidly and easily get out of balance until something breaks, causing a domino effect throughout the economy, and leading to a recession or a depression. 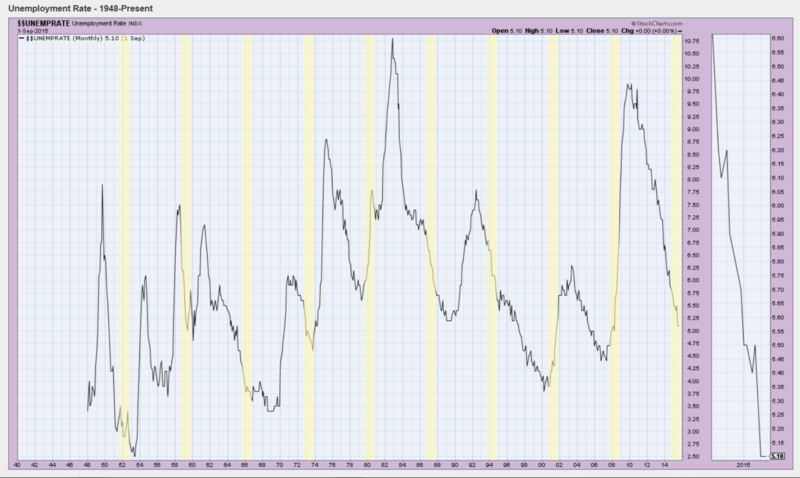 Stocks crash, the financial system collapses, and unemployment rises rapidly, oftentimes taking years to recover. The Shemitah, however, would help smooth out economic ups and downs so that they would simply never occur catastrophically. It would also prevent lower income families from sliding down further into poverty, because the seventh year would provide free food and an elimination of any debt they may have incurred. Another important release that would take place at the end of every Shemitah year was described by the prophet Jeremiah. He said that once every seven years any Hebrews used as slaves among the people would have to be freed (Jeremiah 34:13-14). Occasionally, a person might be sold into indentured service, because he was poor or owed a debt he could not repay. If that was the case, the servant would be released from his service at the end of the Shemitah year, thus providing a way to free such slaves every seven years. This law ensured that Hebrew slaves would not be held as slaves forever, regardless of the debt they owed or the situation they found themselves in. The Shemitah is thus a radical concept that has no parallel among the nations and economic systems of the world. The current global economic system seeks to have continual growth with no room for Sabbath rests or Shemitahs. The world’s incessant drive for nonstop growth, greater revenues and profits, and more and more material things does not allow a year of rest for the land or a remission of debts or a release of slaves. Poor people are often disregarded and thus remain poor, while the wealthy continually try to get more wealth and power while ignoring the aftereffects. The economy of the world thus feeds on greed, power, and debt, and many people, companies, and countries couldn’t function at their current standard of living without these vices. One of the main purposes of the Sabbaths and Shemitahs was to put a damper on the lust for more money and material things, and through this process help return the hearts of the people back to a reliance on God, who is after all the only true source of everything that we have in life. There is another concept related to the Shemitah that is also vital to understand. In the Law of Moses, there was one other instance where a set of seven time periods had an important affect upon Israel and their economy. According to the book of Leviticus, every set of seven Shemitahs was to be followed by a Year of Jubilee in which another major type of release was to take place. Seven Shemitahs is simply equal to 7×7 years or a total of 49 years. The year following the series of seven Shemitahs, or the 50th year, was designated the Year of Jubilee (called “Yovel” in Hebrew). “You are also to count off seven sabbaths of years for yourself, seven times seven years, so that you have the time of the seven sabbaths of years, namely, forty-nine years. “You shall then sound a ram’s horn abroad on the tenth day of the seventh month; on the day of atonement you shall sound a horn all through your land. “You shall thus consecrate the fiftieth year and proclaim a release through the land to all its inhabitants. It shall be a jubilee for you, and each of you shall return to his own property, and each of you shall return to his family. “You shall have the fiftieth year as a jubilee; you shall not sow, nor reap its aftergrowth, nor gather in from its untrimmed vines. “For it is a jubilee; it shall be holy to you. You shall eat its crops out of the field. “On this year of jubilee each of you shall return to his own property. “If you make a sale, moreover, to your friend or buy from your friend’s hand, you shall not wrong one another. “Corresponding to the number of years after the jubilee, you shall buy from your friend; he is to sell to you according to the number of years of crops. “In proportion to the extent of the years you shall increase its price, and in proportion to the fewness of the years you shall diminish its price, for it is a number of crops he is selling to you. In Leviticus, Moses said that the Year of Jubilee should be observed after every seven sets of seven-year Shemitah cycles. Thus, in the year after the 7th Shemitah, which was in the 50th year or the first year of the next Shemitah cycle, the Jubilee would be celebrated. The beginning of the Jubilee year would be marked by the sounding of a ram’s horn on the Day of Atonement (Yom Kippur). This important Jewish holiday occurs in the fall, usually in Late September or early October (it occurred on Sept. 23 in 2015), and it serves to usher in the start of the New Year of Jubilee. According to the statutes of this law, the 50th year would include another year like the Shemitah year of not planting or harvesting of crops; therefore the seventh Shemitah year of rest for the land was followed by another Jubilee year of rest, making two consecutive years of no planting and no harvesting every 49 years. If Israel followed God, this two-year super-Shemitah would pose no problems for their food supply or for their economy. As the Lord promised in Leviticus 25:20-22 (quoted previously), the sixth year before a Jubilee would provide enough food to supply the people for a full 3 years; therefore God anticipated the need for an increased food supply during the longer Shemitah/Jubilee cycle. In addition, the Year of Jubilee would bring a release of property throughout all of Israel. What this meant is that any person or family that sold their property to another Hebrew would get their property back at the end of every 7 Shemitahs. Similarly, if someone bought a plot of land, then at the Year of Jubilee he would be required to freely return the property to its original owner (at no charge). Thus, the 12 tribes of Israel and the families owning property within their territorial regions would never completely lose their land to another family or tribe. Also, the value of property or farm land being sold was to be prorated relative to the time left before the next Year of Jubilee. The greater the number of years left before the next Jubilee, the greater would be the value of the land and therefore the price. In addition, if the poor sold their property because they needed the money, their family would eventually be assured of gaining it back at the Jubilee. In this way, all property bought and sold between Hebrews was really only rented for a time and not permanently transferred or lost. Therefore, the poor would never be poor forever and the rich would not continually devour the property of the poor. Everything regarding property ownership would be equalized again at the Year of Jubilee. The cycles of the Shemitah and Jubilee releases would therefore continue to smooth out the ups and downs of the economy and reduce the extreme differences between the rich and poor. Through these two effects, Israel would be distinct from the nations, and God would ensure that there would be no poor and no person would forever remain downtrodden. In addition, all of Israel would have built-in rest periods designed into their economic system consisting of days and years, which would greatly reduce the stress of life. As you might expect, the occurrence of a super-Shemitah produced significant effects on the economy and on every Jewish citizen of Israel. To follow these laws, the people had to have a strong faith in God that He would get them through the years of no planting, no harvesting, and all this combined with the major economic releases of debt and property. This served to reinforce their reliance on God and decrease their reliance on their own initiative, which is exactly what the Lord wanted to happen. Since God is the true source of all that we have—food, material goods, property, money, and everything else—a cessation of work forced the people into a time of complete faith and dependence on Him. Despite these promised benefits that the Shemitah and Jubilee observances would bring to Israel, it was unfortunately rarely if ever followed during the years of the First Kingdom and the First Temple period. Perhaps it was followed early in Israel’s history, during the time of the Judges and maybe during King David’s reign, but as Israel fell away from God with successive kings, the Shemitah was one of the first rules that fell away and was not fulfilled. It can be a fearful thing to turn away from self-reliance in getting what you need and become completely reliant on God, especially if you have no faith. It was easier for Israel to simply overlook this law rather than to risk not having enough food for over a year at a time or risk losing money by having to forgive debt or give back land. Greed and the desire for money caused many in Israel to ignore the Shemitah and the Jubilee. However, these laws were not ignored by God. As we learned in the four sections on Daniel’s Prophecy of the Seventy Weeks and the section on The Scattering of Judah and Jerusalem, Israel was taken captive into Babylon for exactly 70 years to make up for the 70×7 years (490 years) that the Jews didn’t follow the Shemitah for the land. Thus, the Lord kept them away from their land in judgment for a full 70 years to allow the land to rest for the 70 Shemitahs that Israel ignored. Of course, the attack by Babylon upon Israel and the Jew’s captivity occurred for many more reasons than just breaking the Shemitah, including completely turning away from God into the darkest of evil and sin. Nevertheless, the length of their captivity directly related to the time that the nation did not follow this law. Therefore, the principle of the Shemitah remained in effect even if Israel tried to eliminate it from their lives and culture. Though they tried to run from it, the Shemitah Effect eventually caught up to them and caused 70 years of banishment from their land! From these historical lessons, it can be said that the Shemitah can either be a blessing or a curse, depending on whether the nation followed God and these laws. If the nation followed God in the Shemitah and Jubilee, they would be prosperous and at rest in their land; however, if the nation turned away from God and didn’t follow these laws, they would suffer the effects of the Shemitah as a judgment and with extremely negative consequences. Is There A Broader Shemitah Effect? Since the Shemitah affected Israel so dramatically and caught up to them even when the Jews didn’t follow it for centuries, a valid question might be, “Does the Shemitah Effect relate not only to Israel, but does it also have relevance to the entire world?” Even though Israel as a nation was specifically given the Law of Moses in the beginning to make them distinct from the nations as God’s people, many of the Old Testament laws have application to all of mankind regardless of whether they are Jew or Gentile. For instance, the Ten Commandments clearly have important application to all people throughout all time, not just to the Jews and the nation of Israel. Many other laws also have a universal connotation. What about the Shemitah? In other words, did God design not only Israel’s economy, but also the world economy to ideally function in much the same way that he instructed Israel through the Law? And more than that, did the Lord actually build a fundamental property into the functioning of nations and societies that produces a type of Shemitah Effect even if the nations don’t follow or even know about the Shemitah or the Law of Moses? This is an interesting question and one in which Jonathan Cahn proposed to answer in his books. If the Shemitah Effect not only affects Israel because of the Law of Moses, but also affects the United States and the rest of the world, then we might be able to see its effects throughout the financial realm as it repeats every seven years. This is the effect that many authors have written about in recent years, because the last two Shemitah cycles appear to have had a dramatic effect on the world’s economy. Seeing that the Shemitah Effect includes a year-long event related to the cessation of the agricultural market and an end-of-year effect related to the remission of debt (end-of-year in the Jewish Civil Calendar being in the September-October time frame in the Gregorian Calendar), if there exists any broader impact on the world’s economy this might be reflected in economic downturns during and immediately after these periods. The aftereffects of a Shemitah year should continue to be felt during the first year of the next Shemitah cycle, because the debt release occurs on the last day of the year. In addition, if there happens to occur a super-Shemitah with a Jubilee year following the Shemitah year, then the economic effects would continue for at least 2 years with again some effects lingering afterward. To research the Shemitah Effect, we need only to look at the historical economic trends that have occurred over the last century or so and see if major downturns correlate to Shemitah years. There are many sources of economic data that can be found to map out the recessions or depressions in the world’s economy, including information related to the Gross Domestic Product (GDP) as well as the booms and busts in the stock markets or bond markets, the increases and decreases in currency values, or the rise and fall of unemployment. All or some of these data points would be expected to correlate to the Shemitah years and show up as downturns, if there is really an effect that God designed into the economic systems of the world. This universal Shemitah Effect would presumably occur even if the nations did not follow the Mosaic principles of this law. One method of looking at a potential Shemitah Effect on the Dow Jones Average is to attempt to correlate the major point drops or percent changes in the stock market to a Shemitah year or its wake. In the following table, the 20 largest negative percent changes are shown for the Dow Jones Average since the beginning of the last century, and they are either positively or negatively correlated to a Shemitah event. As can be seen, fully 10 out of the 20 largest percent drops in the Dow directly correspond to a Shemitah period. Note: Unlike Cahn and others who have considered the Shemitah Effect to mainly occur near the end of the Shemitah year or within 1 month of its end (i.e., the Elul-Tishri 2-month time period), this analysis considers the entire Shemitah year to be a time of potential economic downturn. This is due to the fact that from the beginning of the planting season the Shemitah has a negative affect on the economy, because all those people and businesses that make a living through agriculture would experience a downturn throughout that year. Thus, the agricultural effect occurs during the entire year and immediately thereafter, whereas the effect from the debt release occurs only at the end of the year and its wake. Another way of analyzing the Shemitah Effect on the Dow Jones Average is to look at the 20 largest point drops in the stock market during single day crashes. From the following table it can be seen that 14 out of the 20 most significant point drops correlate to a Shemitah year or its wake. This represents a 70% correlation of the Shemitah Effect to the most significant point drops in stock market history. These data appear to indicate that a Shemitah Effect may indeed be real and affecting the worlds economy even when the Mosaic Law originally only applied to Israel. Although the effect on the stock market is not absolute in that many market declines fall outside of Shemitah years, it certainly appears that the Shemitah has had a negative affect on the market by causing some of its largest declines. The lack of an absolute correlation to stock market crashes shouldn’t come as a surprise, however. God often operates within the realm of probabilities in such a way that He makes it difficult or impossible for us to absolutely predict the future. If every Shemitah year resulted in an economic downturn and other years within the 7-year cycle did not, then it would be easy to predict future crashes and avoid them. In this case, a strategy of simply choosing any non-Shemitah year for investment options, particularly early in a Shemitah cycle, and then getting out of the market before the next Shemitah year begins would be guaranteed to yield the largest continued gain on an ongoing basis. The Lord prevents such precise predictions (and guaranteed monetary gains) by making the Shemitah Effect more of a probability and less of a certainty. Thus, while the last few Shemitahs have almost exactly correlated to market crashes—and as Jonathan Cahn has said they may be indicative of a broader approaching judgment upon America—we will not be able to use the Shemitah Effect to predict what will happen during the next Shemitah year in 2021-2022. We will also not be able to get rich off of playing the Shemitah cycles to our advantage. Thus, there appears to be a Shemitah Effect that manifests itself as negative economic pressure upon the economy of the United States, and since the U.S. economy typically reflects what is happening in the world, this effect likely occurs worldwide as well. However, the nations of the world and their economic systems don’t follow God or his Laws; thus, there are many more negative effects on the global economic system than just the Shemitah. Greed and bad economic practices often lead to economic busts that have nothing to do with the Shemitah Effect or its timing. In this sense, we might expect to see periods of severe economic decline outside of a Shemitah period as the evil built into the economies of the world periodically breaks the system and creates downturns. Let’s look at this effect in more detail by considering more extensive data sets. An excellent set of concise economic graphs to use for this purpose can be found at stockcharts.com, which also allows the creation of custom graphs with any desired economic data. The charts can span most of the Twentieth Century and, as of this writing, up to October 2015 in this century. This includes graphs of the major stock market indices as well as graphs for commodities, currencies, bonds, and unemployment levels. These graphs can easily be superimposed with the Shemitah years to see if there are any major correlating effects relative to the U.S. economy (the U.S. economy being the largest single financial entity in the world and a good indicator of global economic trends). 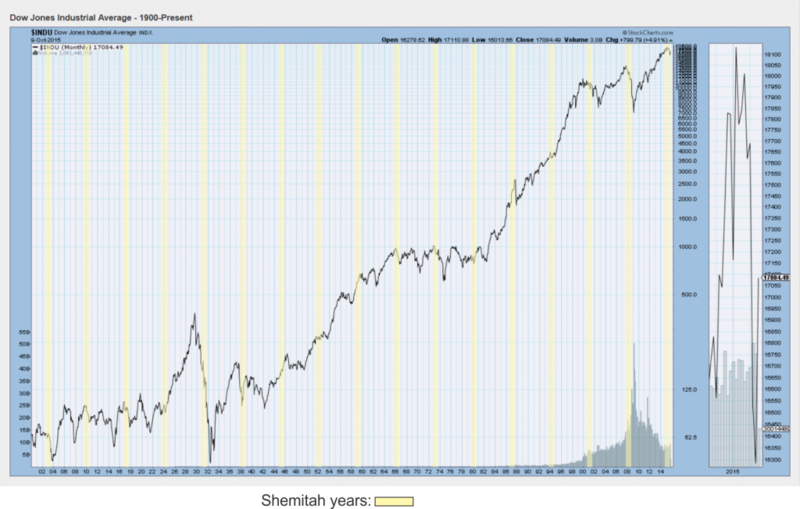 For instance, in the following figure, the Dow Jones Industrial Average stretching from the year 1900 to the autumn of 2015 is mapped with the Shemitah years highlighted as transparent yellow bars on top of the curve. Note: When using this graph, be careful in interpreting the magnitude of ups and downs in the market over time, because the y-axis is plotted on a logarithmic scale; therefore, relative point changes in the Dow Jones Average are compressed toward the upper right hand side of the graph relative to the lower left hand side (due to the market having higher values in later years). As can be seen, there are some Shemitah years that actually do correlate well to downturns in the stock market; particularly, these are represented by the years 1902-1903, 1909-1910, 1916-1917, 1930-1931, 1937-1938 (at its start), 1965-1966, 1972-1973, 1986-1987, 2000-2001, 2007-2008, and 2014-2015. All of these downturns actually occurred during the Shemitah year or within a few months thereafter (i.e., in its wake). Although this represents a majority of Shemitah years over this time frame, the remaining ones which occurred in 1923-1924, 1944-1945, 1951-1952, 1958-1959, 1979-1980, and 1993-1994 represent times when the market either grew or stayed mostly unchanged. The data therefore indicates that throughout this period of over a century in length, 11 Shemitahs out of 17 show a definite Shemitah Effect relative to the Dow Jones Industrial Average. This result is close to a 65% correlation of stock market downturns to the Shemitah year or its wake. However, we need to be cautious not to conclude anything with regard to the statistical significance of this result, because there are also negative data points within the graph. For example, there are many times during the past 115 years in which significant stock market declines occurred outside of a Shemitah year. In reality, the Dow Jones Industrial Average is highly variable and typically will have many increases and decreases over such a long period of time. It is not surprising, therefore, that there are downturns in the market which occur outside of a Shemitah year. These downturns are likely due to the fact that the world’s economies are not run according to the way God intended them to be run, and therefore over time they become increasingly chaotic and unpredictable. Downturns occur for many more reasons than a Shemitah Effect. For instance, there were severe declines in the market in 1907 and 1929 (as a percent decline), but both of these occurred in the middle of a Shemitah cycle and not during the Shemitah year itself or during its wake. In addition, although the Shemitah of 1930-1931 occurred right in the middle of the long stock market slide at the beginning of the Great Depression, the Shemitah year did not occur during the Dow’s initial severe collapse during the fall of 1929. Similarly, in more recent times, the Shemitah years of 2000-2001, 2007-2008 and 2014-2015 correlated almost perfectly to major market downturns, but there was a lack of correlation to the market declines that occurred in the years between them. For instance, there were significant declines in 2003 and 2011 that were both in the middle of the subsequent Shemitah cycles and did not correspond to the Shemitah years or their wakes. Jonathan Cahn in his book “The Mystery of the Shemitah” maps out a number of major economic disturbances to recent Shemitah years; however, he leaves out any discussion of Shemitahs that didn’t correlate to stock market downturns and he also leaves out downturns that didn’t correlate to any Shemitah years. Thus, although the economic busts that he relates to Shemitahs really did occur, the book leaves us with an incomplete picture of the actual statistical significance of the phenomenon. We actually can’t tell from Cahn’s book if the Shemitah Effect really does exist or if it is rather that the global economy is so messed up and it collapses so often that sometimes a downturn just happens to correlate with a Shemitah year. To continue our analysis, the following graph plots the Shemitah years against the unemployment rate over the years 1948 to September 1, 2015. In this chart, an increase in the unemployment rate indicates a downturn in the economy, because higher unemployment usually follows significant economic crashes. The Shemitah years of 1972-1973, 1979-1980, 1986-1987, 2000-2001, and 2007-2008 all correspond to concurrent or subsequent increases in the unemployment rate. In some cases, the rate increased during the Shemitah, while in other cases the increase occurred after the Shemitah year was over (in its wake). However, the Shemitah years represented by 1951-1952, 1958-1959, 1986-1987, 1993-1994, and 2014-2015 all occurred during times of low unemployment and with no subsequent rate increases. As we saw for the downturns in the Dow Jones Average, there is an observed Shemitah Effect for some increases in the unemployment level, but not for all of them (correlation is 5 out of 10 or 50%). Again, the Shemitah Effect appears to be real, but it cannot be used as an absolute predictor of future unemployment levels. The above methods of correlating the Shemitah years or their wake to an observed drop in an economic indicator do not represent the optimal way of showing that a Shemitah Effect is really occurring. Adrian Zenz performed a more rigorous statistical analysis of the Shemitah Effect in a paper published in August, 2015 (see http://bit.ly/1LNdeKE). In his analysis, he looked at a broader picture of economic indicators and whether the Shemitah years have had any significant impact on them. Since he used every major upturn and downturn in the stock market, bond market, and Gross Domestic Product (GDP) in the analysis, his conclusions were that there was very little statistical significance of the Shemitah Effect on these indicators. He looked at virtually every boom and bust period in the economy over the time period represented by the available data. In addition, Zenz also considered a more restricted analysis by using only the 2-month Elul-Tishri Shemitah ending months and the Shemitah wake period in his calculations, just like Cahn focused on in his book. Although Cahn concluded that there was a positive correlation between the Shemitah and economic downturns, this positive conclusion occurred, because Cahn’s analysis did not include all possible data points; neither did it use standard scientific methods of statistical analysis. What Cahn called significant did not really have scientific significance when all the data points are considered and analyzed according to standard statistical methods. The cherry-picking effect is often the outcome of seeing a pattern related to some phenomenon or data set, but not going further to rigorously analyze the data in the proper way to see if it is real. Selectively cherry-picking from data sets can result in seeing an effect that is not really there. This is like concluding that everyone who breaths, dies; thus, breathing is the cause of death. A more in depth analysis would conclude that breathing has nothing to do with eventual death, even if everyone who breaths does eventually die. Unfortunately, some conclusions based upon Biblical cherry-picking often result in ideas that become so popular that overcoming them with real data is difficult. For instance, someone who publishes a new insight related to the Bible or a new way of interpreting prophecy related to the End Times often generates a lot of excitement and attention, and they may even sell millions of books; however, attention and book sales don’t necessarily mean that the conclusions are accurate. So what are we to conclude? Is the Shemitah Effect real or is it imagined? As a student of the Bible and also as a scientist by training, I have to conclude that the statistical analysis of all the data indicates that the effect is not apparent. However, that being said, it still may be possible that there is a Shemitah Effect that affects the economies of the world, but today’s global economy is so contrary to what God originally intended that many more boom and bust periods occur in non-Shemitah years than what would normally happen if the world followed God’s Laws. In other words, a unique Shemitah Effect may be underlying the economic properties of the world, but it is hidden or masked by the economic mess the world has created. Cahn might be on to something in his limited investigation even if he didn’t properly analyze all of the data. An underlying Shemitah Effect might be why the Shemitah years have seen so many downturns in the economy even though it can’t be proven statistically that the Shemitah years are any different than the non-Shemitah years. Another important question to ask is, If the Shemitah Effect is real, why would it affect the entire world when it was originally meant to be a law that only Israel would keep while in their land? Two answers to this question seem plausible. One is that the Lord always intended the nations to function under His ideal economic system and conditions, but sin and corruption have caused the economies to become turbulent and unstable. This instability causes downturns in major economic indicators much more often than what would be expected under a strict Shemitah system. Thus, we now observe that many of the major economic collapses occur during a Shemitah year or during its wake, but many more occur chaotically in other years without warning, because it is a broken system overall. The second reason that the Shemitah might have some effect on the global economy is that we are now in the End Times and Israel is once again a nation in their land. More precisely, God may be causing the Mosaic Laws, which at one time were only meant to affect Israel, to now affect the entire world. He may be doing this because we are quickly heading toward the establishment of the Millennial Kingdom in which Israel will be the primary nation in the world. During the Kingdom Age, the Laws regarding the economy and the Shemitah will be universal and made to affect all nations, not just Israel. At that time, this effect will be beneficial and not detrimental, because the world will finally function as the Lord always meant it to function. There will be no curse, no poor people, no evil, no chaos, and no stress in life. The economies will run smoothly and everyone will have everything they need or desire. Food will grow abundantly and all people, and even all of nature, will be at rest and live in peace. At that time, when everyone is following God’s Laws related to the rest periods and releases of the Sabbaths, Shemitahs, and Jubilees, there will be great blessings in the world, which everyone will appreciate and look forward to with joy.